Instant 24/7 bank deposits enabled with compatible banks across 13 EU countries, offering significant savings for bitcoin users using brokers. 29 January 2016. CoinMate.io, one of Europe’s Top 10 Bitcoin Exchanges, is proud to formally announce that it has enabled Sofort Instant Bank deposits function to enable traders to make instant bank deposits onto their account in Euro, Czech Koruna, and Polish Zloty. It is the first bitcoin exchange in Europe to offer this functionality for up to €250 per day, giving traders a significant discount over broker rates offered by competitive services. Verified users of the exchange can make instant bank deposits from Sofort compatible banks in Austria, Belgium, Czech Republic, France, Germany, Italy, Netherlands, Poland, Slovakia, Spain and Switzerland, taking advantage of a low buy/sell spread on the market, instead of being charged up to 8% from bitcoin brokers. Using Sofort’s TÜV Germany approved system, bitcoin traders can make 24/7 deposits, and instant bitcoin withdrawals. 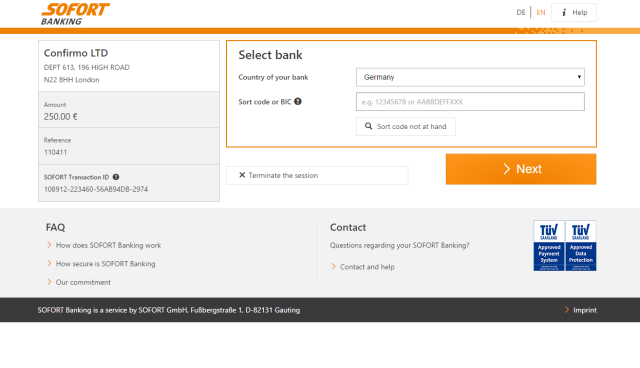 users of the system make payments directly from their online banking, with entry of these details and the confirmation code occurring on the Sofort GmbH website with no sensitive data stored by CoinMate.io. Once successful, the payment is instantly credited to your trading account. where they can make an instant buy/sell order, or place orders on the exchange and take advantage of the maker (0.05%) / taker (0.35%) fees model used by the exchange. Fees charged for Instant deposits are 1.5%, subject to a minimum of €1.00. CoinMate users can also make instant deposits and withdrawals through MoneyPolo (0% deposit fee, 1% withdrawal fee) and OKPay (0.5% deposit fee, 1.5% withdrawal fee). No other Bitcoin exchange market offers that many instant deposit/withdrawal options for such advantageous fees and with no lock-times. 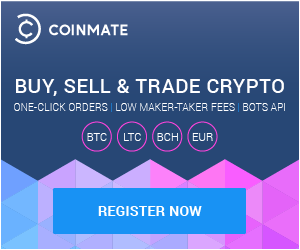 CoinMate.io is one of Europe’s Top 10 Bitcoin Exchange’s by daily trading volume, denominated in EUR. It enables buyers in the SEPA area and beyond, to quickly and easily buy, sell and trade bitcoin with low transaction fees and 1-working day identify verification. Advanced traders can use the exchange via API. 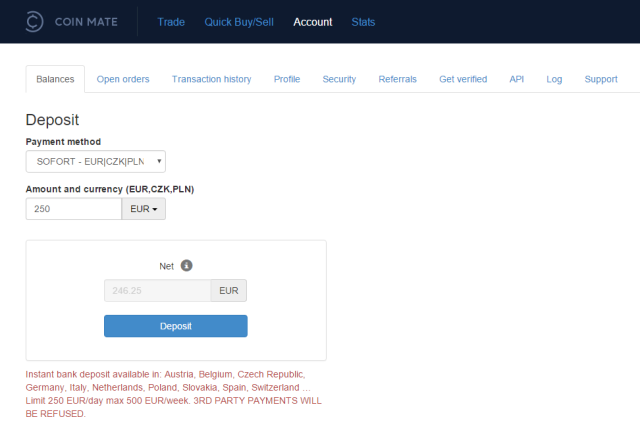 It supports deposits and withdrawals in Euro, Czech Koruna, Polish Zloty, Sofort, Moneypolo and OKPay. The exchange holds 100% of client funds in multi-sig Trezor cold storage, and employs banking grade SSL, and email or Google Authenticator 2FA to give our clients peace of mind. Although Confirmo Ltd. was established in 2014, we were active in bitcoin community since we bought our first bitcoin in 2010 and then mined our first bitcoin in 2011. Our previous project Dagensia provided regulated brokerage services and prepaid debit cards. But we decided to give more to the community and so we established Bitcoin Exchange CoinMate.io and Payment Gateway BitcoinPay.com. Our mission is to provide effective trading and to bring Bitcoin to the masses.